Adele. No need for a last name—everyone knows who she is. To be known and referred to by only her first name invites one to have a personal connection to her, despite not having a personal relationship with her. But that’s who Adele is. She is a people person. She levels the planes between the superstar and the supernormal. And, aside from creating amazingly soulful and iconic smash hits, it is what makes Adele so likable—even lovable. Friday, August 5, 2016, was the opening night of Adele’s eight-night stint at Staples Center in Los Angeles, California. At the focus of the dimly lit arena was the main stage. Each half of the giant backdrop gently angled back from a center fold, enabling every seat in the house to have a view, no matter how far into the wings. Filling the screen were Adele’s recognizable eyes and the bridge of her nose—the eyes were closed, as if she were resting peacefully while her guests arrived and were seated. A smaller elevated stage in the shape of a diamond was isolated toward the opposite end of the arena floor. Waiting to see Adele perform for the first time gave me butterflies. The anticipation among the audience of eighteen thousand was palpable—not a surprise since every concert of her eight-month tour has been—and remains—sold out. Without warning, the arena began to buzz with a calm commotion. It took a second or two to realize why. 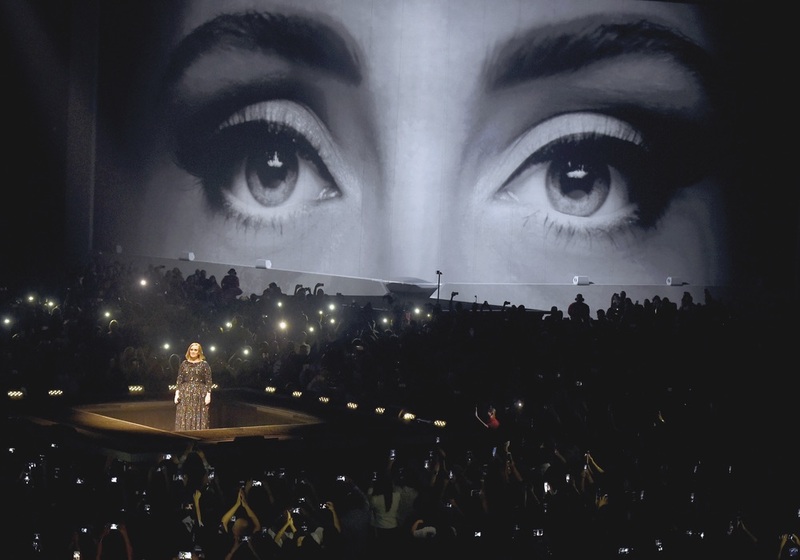 Adele’s eyes had opened—she had awakened! Her beautiful eyes were mesmerizing. Suddenly, the audience came alive with excitement; the lights unveiled Adele’s arrival as she was lifted into view from the small stage and, almost simultaneously, we heard the unmistakable pitch-perfect and soulful alto voice. “Hello,” she sang. But the cheers and screams that filled the arena were short lived and meager compared to what followed. When the next line “I’m in California dreaming about who we used to be” was uttered, it was evident by the ignited frenzy that this crowd was not just any group of fans—they were California Adele fans! The single “Hello” was released a month before her album 25 debuted to astounding success. With over 18 million sold to date, to say Adele is a powerhouse in the entertainment industry may be a bit of an understatement. Because she is so comfortable and honest with herself, she fosters an exchange with her audience that allows them to really feel like they know her. 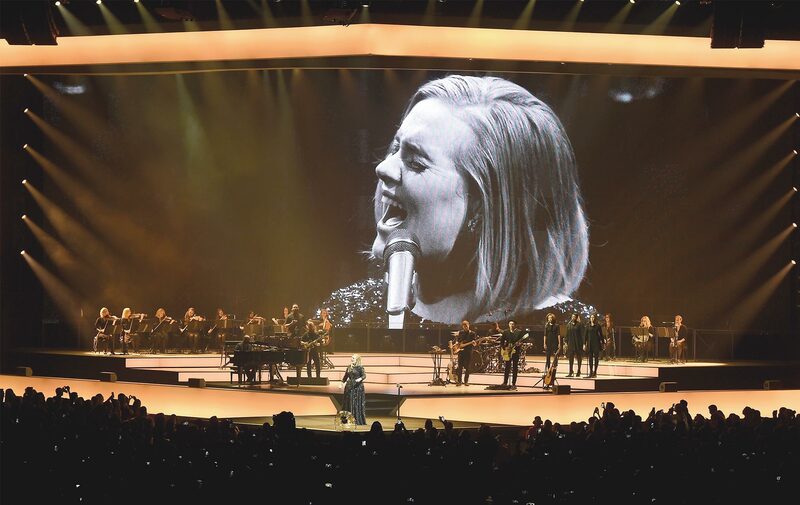 When compared to supercharged, choreographed concerts complete with multiple wardrobe changes and dance routines, the Adele concert is a refreshing contrast. She connects with her audience on an intimate level. “I want you to know me,” said Adele early in the performance. She then described what was happening in her life when she wrote the hauntingly beautiful “Million Years Ago,” also on 25, and how she wished to go back to her time as a teen when she and friends caroused freely in the parks of London. She said that she thought many of us might feel the same way she did when she wrote it. I, for one, did. I was caught off guard by Adele’s passionate delivery of the heartbreaking lyrics. I had never heard the song prior to that night, and my eyes continue to well up even after hearing it dozens of times since. Adele is a songstress in every sense of the word. Like a siren from Greek mythology, she doesn’t need anything but her charisma and talent to serenade a crowd. It’s Adele’s ability to relate to her fans that sets her apart in her industry. She posed for selfies with the audience close by the stage, chatting and laughing with them as she took their phones to snap a pic while giving “it’s all about the bass” gestures. Because she is so comfortable and honest with herself, she fosters an exchange with her audience that allows them to really feel like they know her. She even engaged the crowd to sing a few of her songs with her and stopped to listen as her fans carried the melody with impressive accuracy. She seemed in awe and beamed like a proud momma when everyone knew the words and was singing along. She seemed genuinely excited to share what many other stars and celebrities would consider too personal as she gushed about the love she has for her new baby and said she never knew it was possible to love someone that much. 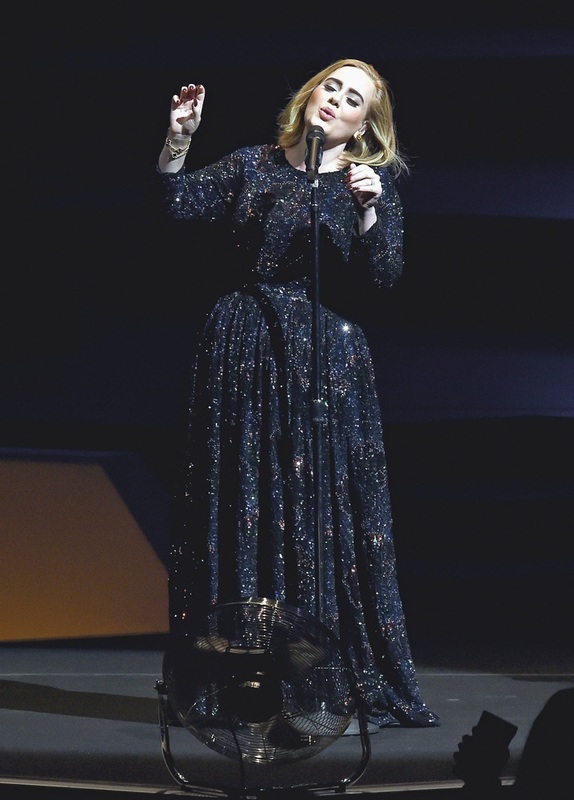 After a few songs, Adele admitted that she had been nervous about performing in Los Angeles. She was used to playing much smaller venues, ones that fostered a more intimate setting, but her connection with the crowd that night, she said, made her feel as if she were at a small songwriters-in-the-round event. Adele also shared with her new friends that she has been eating clean, exercising, and getting accustomed to her new lifestyle in LA, where she’ll now reside six months out of the year; the remaining six will be spent in London. LA is dear to her heart: it’s where she won six Grammys, including Album of the Year, at the 54th Annual Grammy Awards in 2012. She seemed genuinely excited to share what many other stars and celebrities would consider too personal as she gushed about the love she has for her new baby and said she never knew it was possible to love someone that much. Another megahit performed by Adele that night was “Skyfall,” the theme from the James Bond film, which has sold millions worldwide. It was another crowd favorite with brilliant light beams crisscrossed the stage throughout the song. This, coupled with her twenty-piece orchestra, made for a simple and elegant yet powerful performance. Her cover of Bob Dylan’s song “Make You Feel My Love” was spectacular and one of my favorites. But I had so many from that night, I don’t really know where to begin—or end—so I’ll end with a question.